C'est la première fois que je vois de tels bouddhas, ils sont très beaux. Ray: ls sont assez attirants, Martine, et une surprise pour en trouver une collection si proche de chez nous. 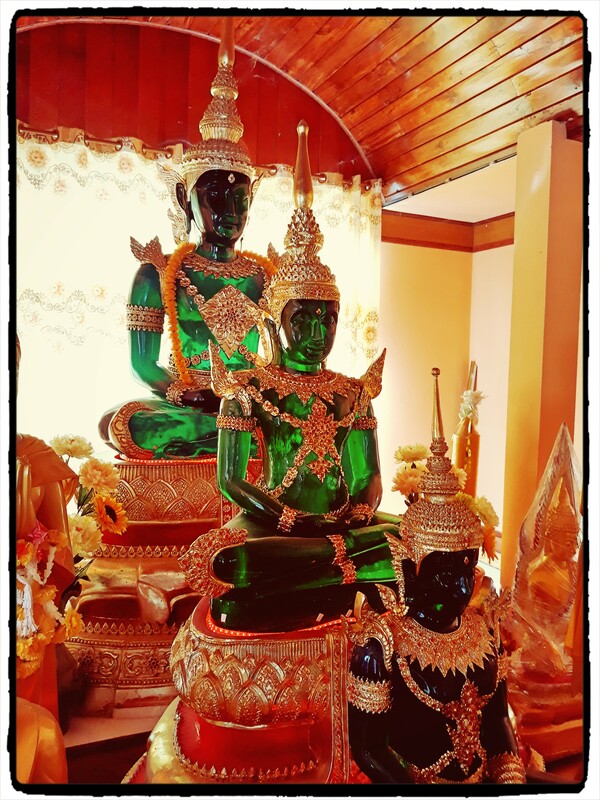 Original ce Bouddha en verre ..
Ray: Il y a quelques icônes de Bouddha en verre en Thaïlande, Claudine, mais ce temple a tout un ensemble d'entre eux. Ray: They certainly catch the eye, Chris. I like these Buddha statues. Ray: I find them to be quite attractive, too, Philine. I wonder just ho many Buddha statues there are in Thailand. Is it right that you can be prosecuted for doing "selfie" in front of a Buddha? Ray: I recall once estimating about 100 Buddha icons for every citizen, so that would be about 650,000,000, Alan. You can be prosecuted for being disrespectful of religious icons, but selfies would not normally be interpreted in this manner. I like glass a lot and like these very much. Ray: They grab one's eyes, Mary. They certainly look very striking. Ray: They are that, Brian, but are not so easy to photograph. They are very striking, Ray. Ray: I found I got better pics of them with the smartphone toy cam than with a serious cam, Frank...the light plays tricks through the glass. One day I will go back with a couple of lights and see if I can do better. Ray: They are good fun, Larry. They are very pretty - and unusual to my eye! Ray: I have seen a few in diverse temples around Thailand, Elizabeth, but this temple seems to favour them. I am thinking I might go back one day with a couple of penlights and see if I can get some interesting refraction effects.